Peter was a tall figure, with a striking build of 6 feet 7 inches, and large, green eyes. Peter I, also known as Peter the Great (Russian: Пётр I Алексеевич or Pyotr I Alekseyevich) (Peter Alexeyevich Romanov), June 9, 1672 – February 8, 1725, ruled Russia from May 7, 1682 until his death, although before 1696 he ruled jointly with his weak and sickly half-brother Ivan V. Peter carried out a policy of "Westernization" and expansion that transformed Muscovite Russia into a major European power. He is arguably the most successful Russian ruler. After his rule, Russia remained a major power in European and world affairs. Russians never quite saw themselves as thoroughly European and subsequently, at times allied themselves with Western Europe. At other times, during the Cold War for example, Russia was an ideological and cultural alternative to the West. Peter, however, oriented Russia toward Europe. Peter, the son of Alexei I of Russia and his second wife, Nataliya Kyrillovna Naryshkina, was born in Moscow. Alexei I had previously married Maria Miloslavskaya and had five sons and eight daughters by her, although only two of the sons, Fyodor III and Ivan V, were alive when Peter was born. Alexei I died in 1676, to be succeeded by his eldest surviving son, Fyodor III. 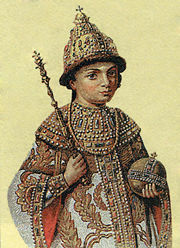 Young Peter with royal regalia. Fyodor III's uneventful reign ended within six years. As Fyodor did not have any children, a dispute over the succession between the Naryshkin and Miloslavskyi families broke out. Properly, Ivan V was next in the line of succession, but he was an invalid and of infirm mind. Consequently, the Boyar Duma (a council of Russian nobles) chose the ten-year-old Peter to become tsar, his mother becoming regent. One of Alexei's daughters by his first marriage, Sophia Alekseyevna, led a rebellion of the Streltsy (Russia's elite military corps). In the subsequent conflict, many of Peter's relatives and friends were lifted up on pikes. Peter even witnessed the butchery of one of his uncles by a mob. Sophia insisted that Peter and Ivan be proclaimed joint tsars, with Ivan being acclaimed as the senior of the two. Sophia acted as regent during the minority of the two sovereigns and exercised all power. In addition, a large hole was cut in the back of the dual-seated throne used by Ivan and Peter. Sophia would sit behind the throne and listen as Peter conversed with nobles, also feeding him information and giving him responses to questions and problems. This throne can be seen in the Kremlin museum in Moscow. For seven years, she ruled as an autocrat. Peter, meanwhile, was not particularly concerned by others ruling in his name. He engaged in such pastimes as ship-building, sailing, and military exercises with mock troops made of local teenage boys. The ships he built were also used during mock battles. Peter's mother sought to force him to adopt a more conventional approach toward his life and arranged his marriage to Eudoxia Lopukhina in 1689. Of their three children, only their son Alexei survived past childhood. The marriage was an utter failure, and 10 years later Peter forced her to become a nun and thus freed himself from the marriage. By the summer of 1689, Peter had planned to take power from his half-sister Sophia, whose position had been weakened by the unsuccessful campaigns in the Crimea. When she learned of his designs, Sophia began to conspire with the leaders of the Streltsy. Unfortunately for Sophia, a rival faction of the Streltsy had already been plotting against her. She was therefore overthrown, with Peter I and Ivan V continuing to act as co-tsars. Peter forced Sophia also to enter a convent, where she gave up her name and position as a member of the royal family. Still, Peter could not acquire actual control over Russian affairs. Power was instead exercised by his mother, Nataliya Naryshkina. It was only when Nataliya died in 1694 that Peter became truly independent. Formally, Ivan V remained a co-ruler with Peter, although he remained ineffective. Peter became the sole ruler when Ivan died in 1696. Peter the First Looking at the Baltic Sea. Peter implemented sweeping reforms aimed at modernizing Russia. Heavily influenced by his western advisers, Peter reorganized the Russian army along European lines and dreamed of making Russia a maritime power. He faced much opposition to these policies at home, but brutally suppressed any and all rebellions against his authority, including the greatest civil uprising of his reign, the Bulavin Rebellion. To improve his nation's position on the seas, Peter sought to gain more maritime outlets. His only outlet at the time was the White Sea; the Baltic Sea was controlled by Sweden. Peter attempted to acquire control of the Black Sea, but to do so he would have to expel the Tatars from the surrounding areas. He was forced to wage war against the Crimean Khan and against the Khan's overlord, the Ottoman Empire. Peter's primary objective became the capture of the Ottoman fortress of Azov, near the Don River. In the summer of 1695, Peter organized the Azov campaigns in order to take the fortress, but his first attempts ended in failure. Peter returned to Moscow in November of that year, and promptly began building a large navy near Voronezh. He launched about 30 ships against the Ottomans in 1696, capturing Azov in July of that year. 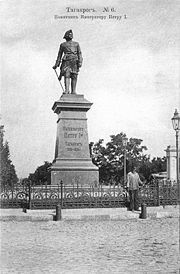 On September 12, 1698, Peter The Great officially founded the first Russian Navy base, Taganrog. Peter knew that Russia could not face the mighty Ottoman Empire alone. In 1697, he traveled to Europe incognito with a large Russian delegation, the so-called Grand Embassy of Peter I, to seek the aid of the European monarchs. Peter's hopes were dashed. France was a traditional ally of the Ottoman Sultan, and Austria was eager to maintain peace in the east whilst conducting its own wars in the west. Peter, furthermore, had chosen the most inopportune moment; the Europeans at the time were more concerned about who would succeed the childless Spanish King Charles II than about fighting the Ottoman Sultan. The Grand Embassy, although failing to complete the mission of creating an anti-Ottoman alliance, still continued to travel across Europe. Upon visiting England, the Holy Roman Empire, and France, Peter learned much about Western culture. He studied shipbuilding in Deptford, London, Amsterdam, and Zaandam, and artillery in Königsberg (Kaliningrad). Thanks to the mediation of Nicolaas Witsen, mayor of Amsterdam and expert on Russia par excellence, the tsar was given the opportunity to gain practical, first hand experience in the largest private shipyard in the world, belonging to the Dutch East India Company in Amsterdam, for a period of four months. The tsar helped with the construction of an East Indiaman especially laid down for him. During his stay in the Netherlands, the tsar engaged with many skilled workers such as builders of locks and fortresses, shipwrights, and seamen, with the help of Russian and Dutch assistants. The best-known sailor who made the journey from the Netherlands to Russia was Cornelis Cruys, a vice-admiral who became the tsar's most important advisor in maritime affairs. Peter's visit was cut short in 1698, when he was forced to rush home by a rebellion of the Streltsy. The rebellion was, however, easily crushed before Peter returned. Only one of the tsar's troops was killed. Peter nevertheless acted ruthlessly towards the mutineers. Over 1,200 of them were tortured and executed, with Peter himself chopping off their heads. Soon after, the Streltsy were disbanded and Peter began to create a new regular army. In 1698 Peter sent a delegation to Malta, under the control of Boyar Boris Petrovich Sheremetyev, to observe the training and abilities of the Knights of Malta and their fleet. Sheremetyev also investigated the possibility of future joint ventures with the knights, including action against the Turks and the possibility of a future Russian naval base. Peter made peace with the Ottoman Empire and turned his attention to Russian maritime supremacy. He sought to acquire control of the Baltic Sea, which had been taken by Sweden a half-century earlier. Peter declared war on Sweden, which was at the time ruled by King Charles XII. Sweden was also opposed by Denmark, Norway, Saxony, and Poland. Russia turned out to be ill-prepared to fight the Swedes, and their first attempt at seizing the Baltic coast ended in disaster at the Battle of Narva in 1700. Peter barely escaped. In the conflict, the forces of Charles XII used a blinding snowstorm to their advantage. After the battle, Charles XII made a mistake deciding to concentrate his forces against the Polish-Lithuanian Commonwealth, giving Peter I time to reorganize the Russian army. As the Poles and Swedes fought each other, Peter founded the great city of Saint Petersburg (named for Saint Peter the Apostle) in Izhora (which he had re-captured from Sweden) in 1703. He forbade the building of stone edifices outside Saint Petersburg — which he intended to become Russia's capital — so that all the stonemasons could participate in the construction of the new city. He also took 16 years old Martha Skavronskaya as a mistress. Martha converted to Orthodox Christianity and took the name Catherine, allegedly marrying Peter in secret in 1707. She would be the future Catherine I. In 1707 the peasants, exhausted by war efforts, rose up again under the leadership of Bulavin. As usual, this rebellion was ruthlessly crashed. Directly following the rebellion, Peter organized land reform. All the land was divided into provinces with appointed governors, who, above all else, were supposed to keep the peasants under control. Normally, the Boyar Duma would have exercised power during his absence. Peter, however, mistrusted the boyars; he abolished the Duma and created a Senate of 10 members. 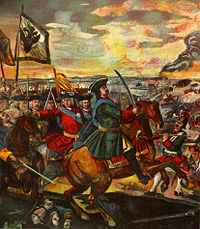 Following several defeats, the Polish King August surrendered in 1706. Charles XII turned his attention to Russia, invading it in 1708. After crossing into Russia, Charles defeated Peter at the Battle of Golovchin in July. In the Battle of Lesnaya, however, Charles suffered his first defeat after Peter crushed a group of Swedish reinforcements marching from Riga. Deprived of this aid, Charles was forced to abandon his proposed march on Moscow. Charles XII refused to retreat to Poland or back to Sweden, instead invading Ukraine. Peter withdrew his army southward, destroying any property that could assist the Swedes along the way. Deprived of local supplies, the Swedish army was forced to halt its advance in the winter of 1708–1709. In the summer of 1709, they nevertheless resumed their efforts to capture Ukraine, culminating in the Battle of Poltava on June 27. The battle was a decisive defeat for Swedish forces, ending Charles' campaign in Ukraine and forcing him into exile in the Ottoman Empire. In Poland, August II was restored as king. At the end of 1710, under the influence of Charles XII, the Ottoman Sultan began a war with Russia. Peter foolishly attacked the Ottomans in 1711. Peter's campaign in the Ottoman Empire was disastrous. Near the river Prut, Peter and his troops were encircled. He was saved by his wife, Catherine. By her request, courtiers collected all their jewels and secretly sent them to the Great Visir, the Turkish army general. He accepted the gift. However, in the ensuing peace treaty, Peter was forced to return the Black Sea ports he had seized in 1697, including Azov. In return, the Sultan expelled Charles XII from his territory. Peter's northern armies took the Swedish province of Livonia (the northern half of modern Latvia, and the southern half of modern Estonia), driving the Swedes back into Swedish Finland. Most of Finland was occupied by the Russians in 1714. The tsar's navy was so powerful that the Russians were able to penetrate Sweden. Peter also obtained the assistance of the state of Hanover and the kingdom of Prussia. 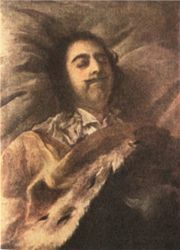 Still, Charles refused to yield, and not until his death in battle in 1718 did peace become feasible. Sweden made peace with all powers but Russia by 1720. In 1721, the Treaty of Nystad ended what became known as the Great Northern War. Russia acquired Ingria (Izhora), Estonia, Livonia, and a substantial portion of Karelia. In turn, Russia paid two million Riksdaler and surrendered most of Finland. The tsar was, however, permitted to retain some Finnish lands close to Saint Petersburg, which he had made his capital in 1712. Peter's last years were marked by further reforms in Russia. On October 22,1721, soon after peace was made with Sweden, he was acclaimed Emperor of All Russia. Some proposed that he take the title Emperor of the East, but he refused. Gavrila Golovkin, the State Chancellor, was the first to add the Great, Father of His Country, Emperor of All the Russias to Peter's traditional title tsar following a speech by the archbishop of Pskov in 1721. Peter's imperial title was recognized by Augustus II of Poland, Frederick William I of Prussia, and Frederick I of Sweden, but not by the other European monarchs. In the minds of many, the word emperor connoted superiority or pre-eminence over "mere" kings. Several rulers feared that Peter would claim authority over them, just as the Holy Roman Emperor had once claimed dominance over all Christian nations. Peter also reformed the government of the Orthodox Church. The traditional leader of the Church was the List of Metropolitans and Patriarchs of Moscow. In 1700, when the office fell vacant, Peter had refused to name a replacement, allowing the Patriarch's Coadjutor, or deputy, to discharge the duties of the office. In 1721, Peter followed the advice of Feofan Prokopovich and erected the Holy Synod, a council of 10 clergymen, to take the place of the Patriarch and Coadjutor. Peter also introduced new taxes to fund improvements in Saint Petersburg. He abolished the land tax and household tax, and replaced them with a capitation. The taxes on land and households were payable only by individuals who owned property or maintained families; the new head taxes, however, were payable by serfs and paupers. In 1724, Peter had his second wife, Catherine, crowned as Empress, although he remained Russia's actual ruler. All of Peter's male children had died—the eldest son, Alexei, had been tortured and killed on Peter's orders in 1718 because he had disobeyed his father and opposed official policies. Alexei's mother Eudoxia had also been punished; she was dragged from her home and tried on false charges of adultery. A similar fate befell Peter's beautiful mistress, Anna Mons in 1704. In 1725, construction of Peterhof, a palace near St Petersburg, was completed. Peterhof (Dutch for "Peter's Court") was a grand residence, becoming known as the "Russian Palace of Versailles" (after the great French Palace of Versailles). In the winter of 1723, Peter began having problems with his urinary tract and bladder. When these problems reoccurred in the summer of 1724, a team of doctors performed surgery. According to legend, while on a visit along the Finnish Gulf the following November, Peter saw a group of soldiers drowning near Lakhta and assisted in their rescue. 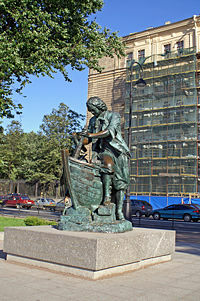 The cold water rescue is said to have exacerbated Peter's bladder problems and caused his death on January 28, 1725. The story has been viewed with skepticism by some historians. German chronicler Jacob von Stählin is the only source for the story, and it seems unlikely that no one else would have documented such an act of heroism. However, the story may still be true, but not reported because of Peter's modesty (Hughes, 198). Whether the rescue took place or not, Peter did die of bladder problems (Hughes, 200), and the story of his heroic sacrifice is wide spread and often reported as unquestioned fact. A law of 1721 had allowed Peter to choose his own successor, but he failed to take advantage of it before his death. The lack of clear succession rules led to many succession conflicts in the subsequent era of palace revolution. Peter was succeeded by his wife Catherine, who had the aid of the imperial guards. Upon her death in 1727, the Empress Catherine was succeeded by Alexei's son, Peter II, bringing the direct male line of Romanov monarchs to an end. Thereafter, inheritance of the throne was generally chaotic—the next two monarchs were descendants of Peter I's half brother Ivan V, but the throne was restored to Peter's own descendants by his daughter Elizabeth through a coup d'état in 1741. No child would simply and directly succeed his or her parent until Paul followed Catherine the Great in 1796, over 70 years after Peter had died. Controversies about Peter the Great are endless; the debates drag on without consensus. 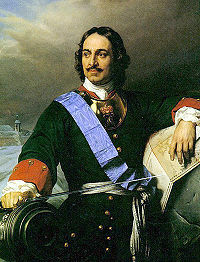 However, recently the Russian people voted Peter the Great as the best-loved Russian of all time. A statue of Peter I on the bank of the Moskva River is one of the tallest outdoor sculptures in the world. Monument to Peter the carpenter in St. Petersburg. ↑ The Russian Grand Priory. The Russian Grand Priory—Timeline. Retrieved May 29, 2007. History of "Peter I of Russia"
This page was last modified on 4 April 2008, at 00:00.